That last blog post got away from me a little bit, so now that you know HOW I ended up with them, lets get to the more exciting part! We made the 16 hour trek up to Ohio to pick up the mares (Tres and Topaz) on my birthday. I don’t think anything will ever top them as a birthday present - DH probably set the bar a little too high for himself considering that was my first birthday after we got married, but I digress... haha. Does it get any better than these beauties in your front yard? We got to meet the mares late the night of my birthday, then back to our hotel to try to catch some sleep before getting back on the road early the next morning. Tres had traveled a little more (she was bred in Missouri, and then moved to Illinois and then Ohio), but Topaz had only been trailered once in her life. Getting them both on the trailer was a little bit of an adventure, but we eventually managed to get them both loaded up and hit the road. 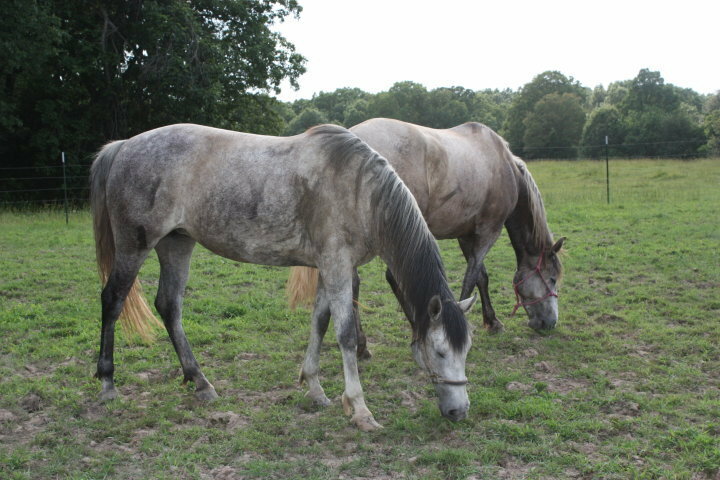 They traveled like champs and before I knew it I was back at home with two new green horses to work. “Green” might be a bit of an understatement - Topaz was almost 16 hands, probably 1100 lbs, and not really halterbroke. The morning after, realizing I was in over my head. 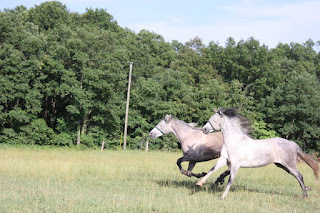 I quickly realized I was out of my depth trying to get them both under saddle, so I sent Tres off to a talented trainer with Andalusian experience -- the Iberian temperament is very unique, and I wanted to be sure the person training them was familiar with it. 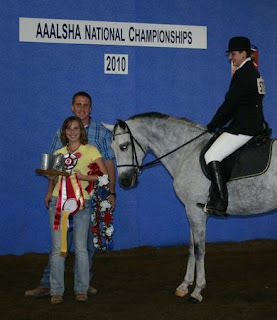 The goal was 90 days (so basic walk/trot/canter) and possibly Nationals, if she was ready. The year I sent her just so happened to be the year that there was an Andalusian national show in my state, and it coincided with the time she was at the trainers - fate? I don’t know, but when the trainer called to say she thought we had a shot in a dressage suitability class, I told her we were in! Definitely a dressage suitability horse! The show was a little over an hour from my house, so I was only able to attend the show to watch her qualifying class and then her championship class. The qualifier was on Tuesday, and it was only Tres’ 9th ride under saddle (the trainer did extensive ground work and long lining to prepare for being ridden). She breezed through it, handily winning her class and qualifying for the championship that weekend - chalk that up to a great foundation! I was so thrilled with how she was progressing under the trainer, and excited to bring her home and take her for a spin myself! Obviously, I was much more nervous for the championship class - stiffer competition, more people in the audience to distract her, and more on the line! 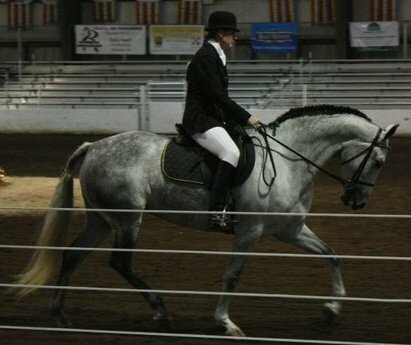 She’d been worked in between the qualifier and championship, but not ridden, so it was only her 10th ride under saddle. 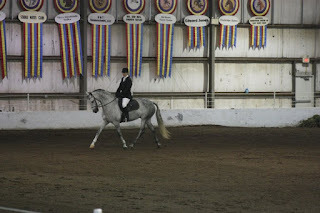 It was a fairly large class by the show’s standards, five horses. Of the four other competitors, all of them had VASTLY more under saddle experience than her. 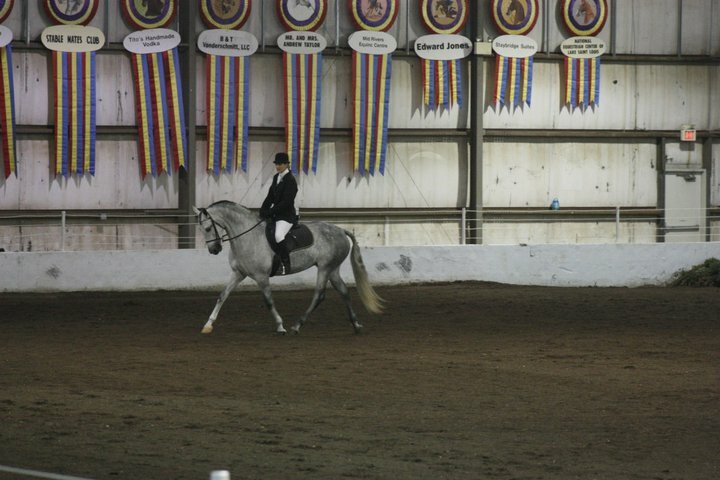 It was also one of the more interesting classes of the show (at least that I saw) -- at one point, the horse in front of Tres bucked it’s rider off, and then coming into lineup, another horse spooked off the rail directly into Tres. She handled everything like a champ, staying focused on the trainer and keeping her cool. Cool as a cucumber, Leigh Anne Romans up. When they announced that she was unanimously named reserve champion, our entire group (myself, DH, my mom, the dachshund breeder who introduced us to Tres’ previous owner, and the clients from the trainer’s barn) all started screaming. Poor Tres was not about all that noise, and wouldn’t let them hang her ribbons on her for photos. DH and I ran out to accept her ribbons and pose for her winner’s photo. 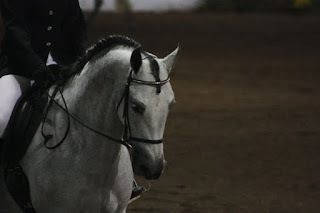 It was probably one of the most memorable nights of my life -- to go from thinking Iberian horses were an unattainable dream, so standing with mine posting for a win photo over the course of less than a year was life-changing. And the fun had only just begun! First Ride in the New and Improved Arena! Mr. Sandman, Bring Me A Dream!